There are three notable anniversaries this month. April 14th was the 2nd anniversary of Terry's memorial where several hundred lucky fans were in attendance at the Barbican in London. April 28th would have been Terry's 70th Birthday and we'll be celebrating the date in Wincanton with an assorted bunch of loonies. April 30th will be Discworld Monthly's 21st Birthday and again we'll be celebrating this milestone in Wincanton. Before our next issue another important anniversary. On 1st May it will be twenty years since The Last Continent was first published! Today (26th April 2018) The Amazing Maurice and His Educated Rodents get a new amazing cover by Laura Ellen Anderson. We love Laura's cover and hope that they inspire a whole new generation of young readers to pick up Terry's books. We've been busy beavering away on our website this month and now have new pages for Regular Fan Meetings and Discworld Events. The website will show the latest information we have and the newsletter will now just show a summary of what's coming soon and any new or modified information. Last month we finally got around to releasing our new Soul Music mug design. Featuring Imp, Glod and Cliff mid concert. The deadline for submissions to issue 254 of Discworld Monthly is Wednesday 23rd May 2018. We took advantage of technology this week and dialled up Daniel Knight of Snowgum Films to see what was happening with the Epic Film that is Troll Bridge. He reassured us that they are working on the trailer and that we would be hearing from them very soon. Daniel is a friend of ours and thus the conversation was very much a two way look at how much working within the Discworld affects us all. If you are interested in watching "A Conversation with …. Daniel Knight" then head over to our YouTube channel. Birdworld are celebrating the anniversary of the Terry Pratchett Owl Parliament with Discworld Day on Sat 26th May. To book tickets online in advance to save 10%, visit their tickets page birdworld.co.uk or arrive in Discworld-themed costume on the day to receive a discounted entry rate of 25% per person. A special prize will be awarded on the day to the best dressed adult and child visitors. Tickets are now available to the Chalke Valley History Festival. If you buy tickets to either of the above events, it also gives you entry to the whole festival for that day. Neil Gaiman has recently tweeted that they are filming pick-ups for the series. Pick-ups allow the editing team to capture angles missed or to re-record dialog or extra bits that help tell the story better. From a fans perspective this is great news as it means things are progressing well. Some of you got in touch with your thoughts about Good Omens. Steve Parkin wrote "Wot no Bikers! probably couldn't find the budget for the fish! Seriously looking forward to it." Nathalie Eeckhout wrote "Ginger? Crowley is not Ginger !!!!!" Recently the European Literary Fair 2018 was held in the Philippines. It celebrated the richness and diversity of European writing covering genres from all the corners of Europe. The Fair started on the 3rd April and lasted for 3 weeks. Terry Pratchett's Discworld series was showcased alongside J.K Rowling's Harry potter series in the speculative fiction section as well as the Witcher compilation by Polish writer Andrzej Sapkowski. The project is part of the active efforts of the European Embassies and cultural institutes in Manila. It aims to showcase European diversity and at the same time promote transnational circulation of literature. Paul Kruzycki of Discworld Ales is circumnavigating the Isle of Wight, on foot, in one go in May. He is doing two and a half marathons (That is 65 miles!) over the course of around 30 hours. He is doing the run to raise funds for one of Terry's favourite charities, the Alzheimer's Society. Micro Arts Studio will have a very special release on Terry's 70th Birthday. Limited edition metallized miniatures of Rincewind, Luggage and Twoflower will be available on Sunday April 28th FOR ONE DAY ONLY! What's more, a new bust will show up in the near future. Which character will it be? Brewed at Boathouse Brewing, just outside of Unseen University in the Discworld.com region, Discworld Ales L Space Voyager is a German style Hefeweizen with banana and peanut notes; it's soft and extremely drinkable, and is perfect for any Discworld fan. SFX is celebrating its 300th issue with an amazing article entitled "300 Reasons Sci-Fi conquered the world!" Reason 132 is Terry Pratchett! A short interview accompanies the entry into the 300 reasons with Rob WIlkins explaining how and why Terry would examine things like the creation of the railways and especially why Terry explored football when he knew nothing about it. We have an About the Convention section which should answer most of your questions, especially if you're new to the idea of Discworld Conventions, or the Irish convention itself. We're a bit different from other fan events such as a ComicCon – Discworld conventions don't focus on the commercial aspects of fandom, but rather on the joy of spending time together as fans. We like to create a friendly and welcoming atmosphere where people who share the same sense of humour can relax and let their hair down. I would encourage anyone who has thought about attending a fan event and worried about not being 'nerdy' enough or fitting in to cast those doubts aside. Even people who've not read a Discworld book at all came come along to fan gatherings of all shapes and sizes, from Washington to Wincanton to Woolloomooloo, and have an amazing time. I attended my first Discworld Convention in 2006 - little did I know that I'd end up running one a few short years later. Discworld cons are a great please to meet friends you didn't know you had. I'm forever grateful to the three Mad Irish Girls who thought that Ireland's ceol, craic agus caint (music, fun and chat) was the perfect pairing with Discworld fans energy and enthusiasm. This IDWCon we'll be visiting the Discworld region of Überwald, focusing on the delightful village of Schnapp, whose inhabitants are keen to tempt tourists to their Sektoberfest. Schnapp's tourist board will be sending out promotional material and further information as we near the convention, so make sure you sign up to our newsletters to keep up to date. If you'd like to become more involved prior to the convention, or you have a question that isn't answered on our website, please feel free to email (or contact us through our Facebook Page or our Twitter) and our team will get back to you. We hope to welcome you to IDWCon, a Convention you can really get your teeth into. ↑≡2.9 Troll Bridge News - There's still time get your order in for now! Q1. What are the Nadgers? Q2. Where did Sgt Colon send his wife on holiday? Q3. Lord Downey burned a book owned by Havelock. What kind of book was it? Q4. On whose behalf does Foul Ole Ron warn Vimes? And finally a joke question. Q5. Why should captain carrot like Iron Maiden? The Berry Theatre in Hedge End hosted the Stephen Briggs adaptation of Wyrd Sisters in April. The Maskers lived up to their motto "The amateur theatre company with professional standards". The 18 strong cast were all experienced and highly skilled. The timing was spot on with the full house raising the roof. Spoiler alert, for those unfamiliar with the play, Wyrd Sisters is Pratchett's masterful adaptation of Macbeth, replete with ghosts, revenge, a play within a play, political intrigue - although no mention of Brexit, betrayal, love, destiny, a crown, magic, broomsticks and a kiss that lasts 15 years - but no meddling! The hilarity started whilst we were all taking out seats with the puppet Greebo widdling on stage. Ian Wilson's Fool can caper with the best of them. Marry Nuncle! The three witches - Marie McDade's Granny Weatherax, SJ Wareham's Magrat Garlick and Ros Liddiard's Nanny Ogg were a perfect match for Paul Kidby's illustration, particularly with the green lighting. During the play within a play the witches and the ghost heckled from the audience, brilliant! The set was simple but amazingly effective. The full house all had a great evening and we left the theatre to be greeted by a terrific and appropriate thunderstorm. This month we have a copy of The Amazing Maurice And His Educated Rodents featuring the new cover art by Laura Ellen Anderson. Send your answers along with your postal address to: by Wednesday 23rd May 2018. Last month we had one of our brand new Soul Music mugs AND a 5GBP Waterstones gift card up for grabs. I'm happy to say that nearly all the entrants recognised Joe as the artist! The randomly selected winner was: Andrew Gibson of Perth in Scotland. We'll get your prize in the post as soon as possible. We assume any correspondence is eligible for use in the newsletter unless otherwise stated, including the sender's email address. We may edit your letters by wrapping them around the nine pin and hurling bowling balls at them. Thanks mightily for the 'View in your browser' link. Perfect solution! What's odd about Amazon Prime's US stream of Colour of Magic (aside from the traditional "to 'u' or not to 'u' issue) is that the first episode just stops at one hour; the second hour just starts and 30 minutes in end credits roll followed by the (UK/Sky) pt. 2 intro, and at 60 minutes it... stops. The third hour starts and plays out to the end credits. I've seek the Sky version so I know it's 2 x 90 minutes, and can't imagine why Amazon did it this way. When "Hogfather" was broadcast here in the US in 2007 (on the ION network) it aired as it had in the UK, albeit with additional scenes (again, I've seen both) ; the DVD released here at the same time was as broadcast. Weird is all. Just.. weird. Anyhow, more than you probably wanted to know, but I did want to answer your question. OOOK to you and Rachel for all you do! P.S. Amazon Prime in the US has also now added Hogfather, again in 3 episodes with the broadcast break midway through the 2nd "episode" (despite its original US broadcast on ION TV in 2 episodes) . It is the US edit, tho. It includes for example Banjo's "What I don't understand is how long has this place had waiters?". This will be my tenth Manchester 10k. This year I am once again going to raise money for Alzheimer's Research. Just a quick comment to those using iOS8, if they upgrade to iOS10, I think that is the latest, then all the links apart from jump to index work in the emails. Or at least they do on my iPhone X! Love the Greene sculpture! Keep up the work honouring TERRY! Book Club that discusses Terry Pratchett's books. Everyone Welcome. This month's issue is brought to you by the the robots of Westworld, the spaceship Rocinante and Rick Grimes (not to be confused with Sam Vimes) . 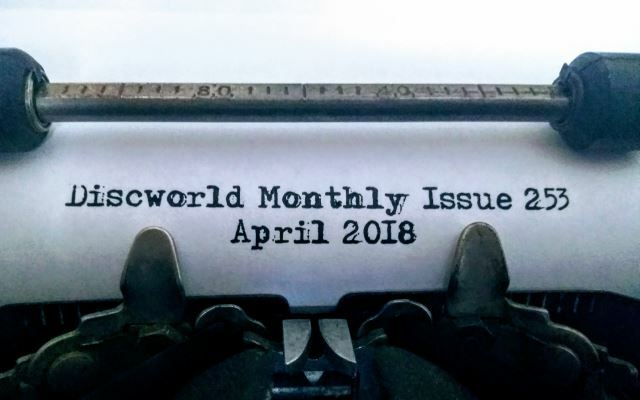 Please let us have any submissions for issue 254 of Discworld Monthly by Wednesday 23rd May 2018. A2. Quirm to see her Aunt! A3. A picture book about hiding in plain sight. A5. He's known as headbanger to the Dwarfs. 2.9 Troll Bridge News - There's still time get your order in for now!